Looking for a simple and easy-to-make apple dessert to make for your family? A recipe that doesn’t require many ingredients? I’ve got you covered! 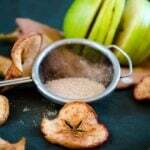 This Cinnamon Baked Apple Slices Recipe is made with orange juice, brown sugar, cinnamon, cornstarch, water and almonds. Everything comes together in 5 minutes and is ready for baking. As a true lover of fall season, I’ve been enjoying the change in nature these days. It seems like leaves are losing color, but I think they just transform and getting new colors. 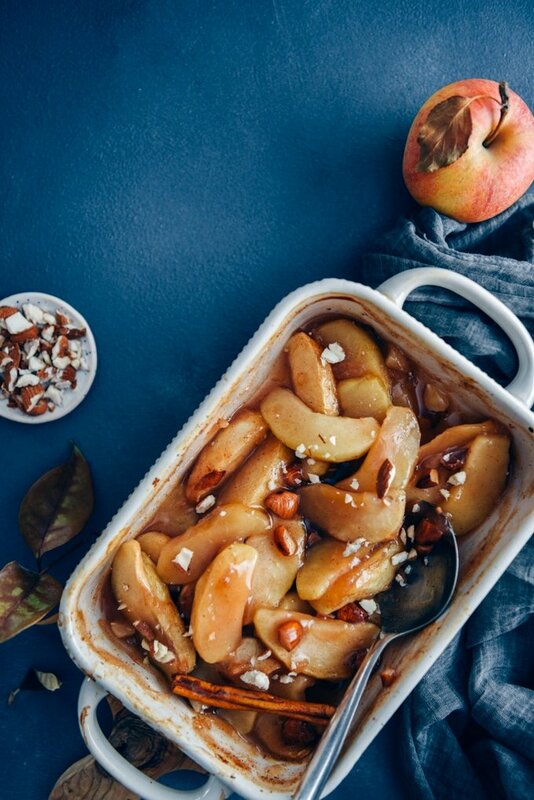 Yellow, brown and orange leaves are everywhere and the weather is much cooler, which naturally takes me to the kitchen more often to make comforting recipes like these Baked Apple Slices. This super easy fall dessert is perfect to start the baking season if you haven’t already. I know these are nothing but sliced baked apples, but the taste is guaranteed. 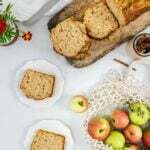 I’m pretty sure this will become your go-to dessert recipe that you make whenever you have tons of apples and don’t have energy to bake Apple Cinnamon Bread, which is another favorite of us in this season. The first thing I would like to tell you is that it is totally your choice to make this recipe with or without sugar. If the apples you use are too sweet, just leave it out. Also, the amount of sugar I give here is the way we like it. You can adjust it to your taste after your first try. Also, the type of sugar you use is up to you and your diet as well. I love the caramelization of brown sugar, so I use it in this recipe. If you want to use a natural sweetener, then use coconut sugar, agave or maple syrup. Just like our Cinnamon Sugar Apple Chips recipe, this one is ridiculously easy and simple too. With a few extra ingredients. Start with peeling and slicing the apples as evenly as possible. Don’t make them too thin. Add them to a baking pan. Sprinkle brown sugar, cinnamon, cornstarch and almonds over them. Finally, pour a little orange juice and water. Toss so that everything is combined. Cover with foil. Bake for 50 minutes and remove the foil. Bake for an additional 15 minutes uncovered or until the apples are tender but not mushy. Can I make this in microwave? Yes! Although I prefer baking them in oven for the perfect result, cook them in microwave when you don’t have time or patience. 3-4 minutes on high heat would be enough. Unlike the oven baked version above, I suggest that you don’t add cornstarch and water when using the microwave method because the duration is just a few minutes. Yes you can. Add a little water and then reheat it in the preheated oven or in the microwave. Can I leave the skins on apples? If you don’t mind them when eating, yes you can. They even give a nice color to the result. Yes, you can keep these baked apples slices in the freezer up to one month. Make sure it is covered well. Just thaw it and reheat before serving. Add a little water when reheating. Breakfast: For one thing, you can serve them as they are and they make one of the best gluten-free breakfast recipes for chilly mornings. Also, you can use these apples for your breakfast bowl toppings. I’m planning to top my Warm Bulgur Breakfast Bowls with these apple slices next time I make it. 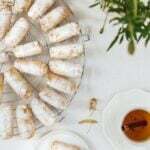 Dessert: These can easily become a hit at your home as a dessert when served with a dollop of cream or vanilla ice cream on the side. Side Dish: You can just leave out the sugar and serve these cinnamon apples to complement a meat dish. Want more apple recipes this fall? Check these out! If you have a chance to make this Cinnamon Baked Apple Slices Recipe, I’d love to hear your feedback! Please rate the recipe and leave a comment below! Yummy! My mouth is really watering at the first glance 😂 Even you boiled 50 minuties, it didn’t look dry but so good.